Today I wanted to fish Putah Creek at winter low flows however when I arrived I was shocked to discover that the green river had turned brown! 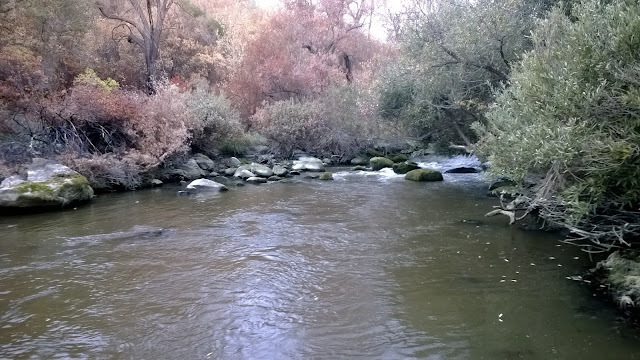 After that disappointment, I drove to the Yuba where conditions were the complete opposite; bright and gin clear. From the information that I could gather online there are two theories of why the creek was lowered from 200 CFS to 40 CFS within a day. Theory one is that the flows were lowered so that the Sonoma County Water Agency could clean the canals and theory two is that this was the time to turn down the faucet due to agriculture season ending. 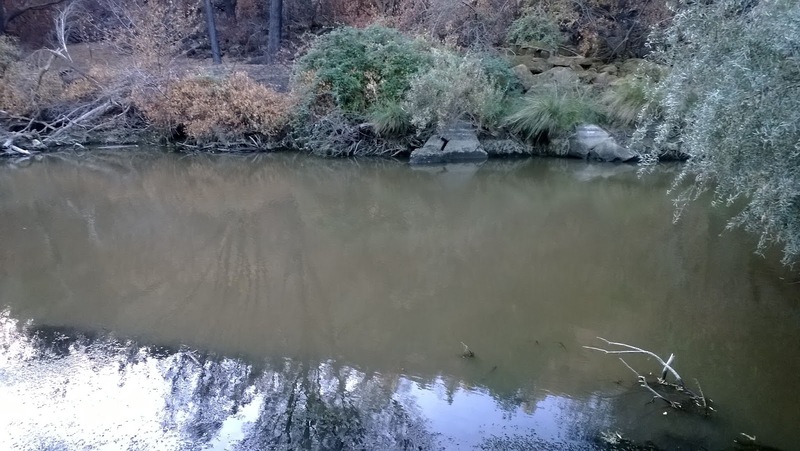 Putah Creek is no stranger to fluctuating flows but why is it blown out? Here is my hypothesis of why the creek is blown out. The Wragg Fire burned nearly all of Sonoma county's side of Putah Creek leaving the ground ashy and covered with soft dirt. On Friday night and Saturday morning the valley experienced it's first true bit of fall rain. It might have been the rain and ash mixing together that turned Putah Creek's usual green to brown. I could smell the stench of ash and water as I hiked around access 3. Or could be the runoff from the canal cleaning? Confirmed: Sonoma County Water Agency has lowered the flows to clean the canals. Honestly I don't think the fishing will get any better if we continue to get on again off again rains and low flows, therefore I'm going to call it quits on Putah Creek for the rest of the year. It's been a good one! Hopefully one less angler off the water will help these fish cope with these crappy conditions. The Yuba River is still tough. 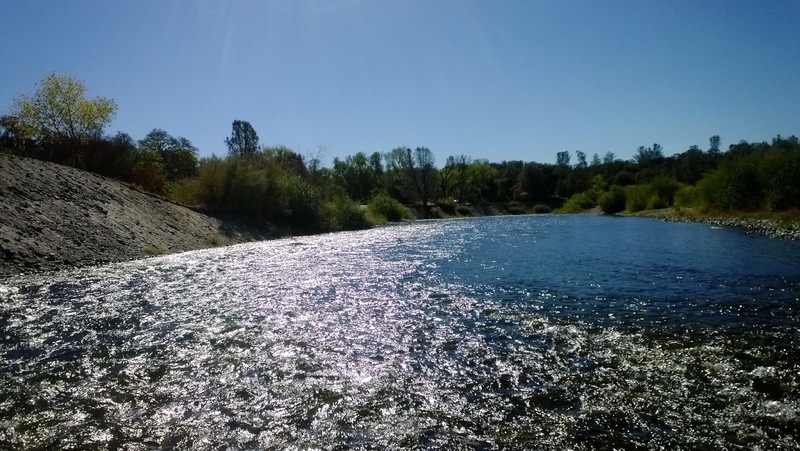 What was suppose to be 80 degree weather felt more like 90 degree weather out there and despite the Yuba getting some rain on Saturday, the water is still gin clear and low. In addition to these tough conditions, I had the luxury of fishing during 10-15 MPH winds. Extremely frustrating! 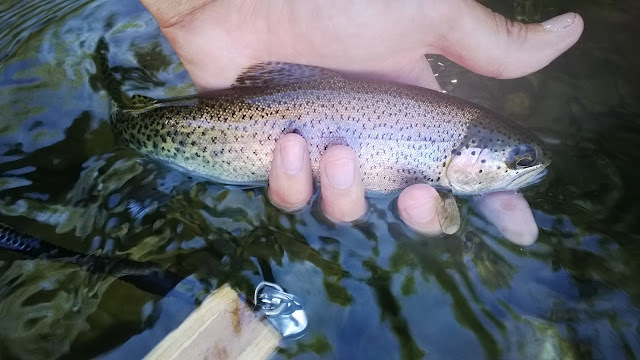 The day ended with two bows landed. One small, one big. I tried putah on October 18. 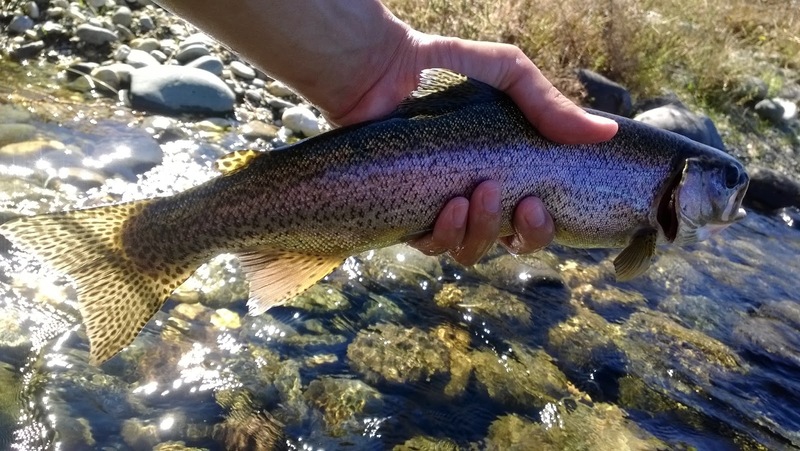 The water was clear but still at 40 CFS. I left after seeing a guy on a paddle board at #5! Dang must have been bad timing. If it was clear on the 18th I wonder why it was so muddy when I went then. Hmmmm. Is 40cfs even enough water to paddleboard in. Lol!